We Filipinos love to take care of ourselves. Whether male or female, we’re very conscious of our personal hygiene, how we look, and how we smell. Part of our daily schedule includes taking a bath or a quick shower, and it’s normal for us to do this more than once a day. Even during fall or winter travel when I literally don’t sweat, I make it to a point to bathe before getting out of the hotel (with my hair still wet – just can’t break the habit!). Using beauty products in our daily lives is like drinking water for survival. Thanks to the Philippines’ abundant malls, supermarket and drugstores, my beauty must-haves are always just a few minutes away from home. I don’t need an expensive face wash to keep my face clean or a luxury soap to make my skin smooth and moisturized. 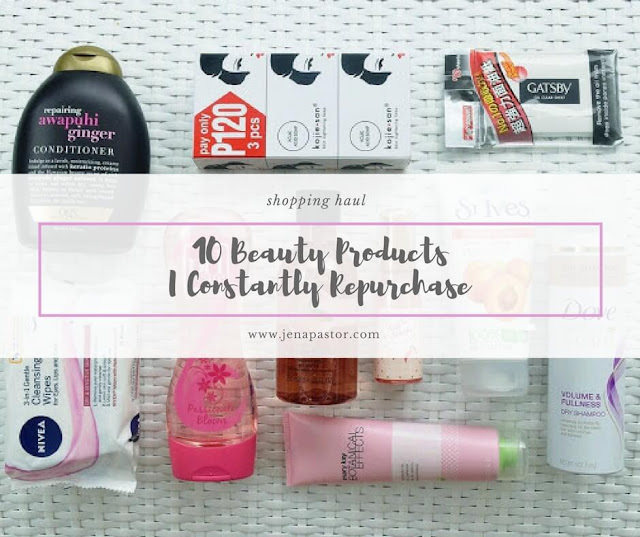 All I need are these 10 beauty products that I constantly repurchase for my face, hair, and body. I always keep a pack of oil absorbing film inside my bag wherever I go. I’m the type of person who doesn’t like to retouch her makeup throughout the day, that’s why I spend largely on high quality and long-lasting cosmetics. I’m not a fan of piling up on powder to remove shine because excessive amount of products will just clog my pores. With an oil absorbing sheet, all I have to do is blot away oil on my T-zone and my makeup will look “retouched”. 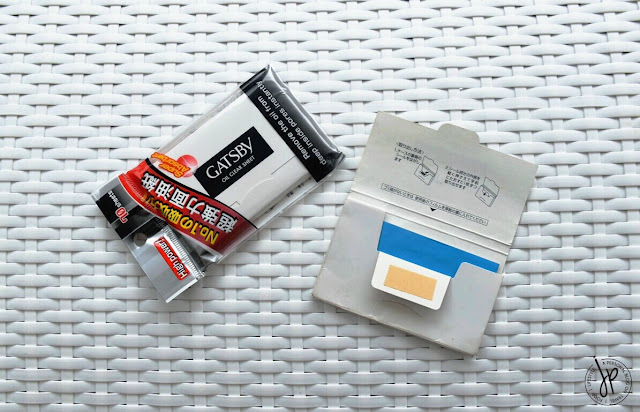 I prefer using Gatsby Oil Clear Sheet (which is a blue film) over the paper-type blotting sheet because the latter tears easily. If you’re familiar with Clean & Clear Oil Control Film, the blue sheets are the same as with Gatsby – only the Gatsby one is around Php 10 less and has 10 more sheets. I usually look up for this brand at the men’s care section. 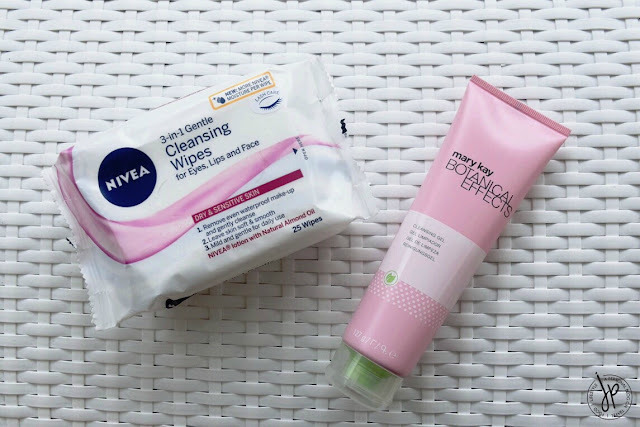 Before I remove my makeup with an oil or balm, I always wipe my makeup first with Nivea 3-in-1 Gentle Cleansing Wipes for Dry & Sensitive Skin. I like how the towels are extra moist and that the material is durable, but soft to the skin. Because of the quality, I only need to use a maximum of 2 wipes for my face and neck. This helps soften eyebrow pomade and stubborn mascara. I also find that this doesn’t irritate my skin unlike its other variant which is the 3-in-1 Deep Cleansing Exfoliating Wipes. These wipes cost almost Php 300 a pack in Watsons Singapore, but it’s more affordable here in the Philippines, especially when Nivea holds their annual 50% discount on all their products. Gel cleansers work best with oily skin because they are usually oil-free, but they still help retain the skin’s moisture. Since I have an oily T-zone and trouble-prone skin, I find that Mary Kay Botanical Effects Cleansing Gel is gentle on my face. It helps speed up the process of healing and lightening pimple marks. The ingredients used for these are “naturally derived from coconuts”, plus antioxidant-packed dragon fruit and aloe extracts. While the packaging says it’s fragrance-free, I could still smell a tiny hint of fruity scent which I really love. It’s non-comedogenic so it doesn’t clog the pores. I use this day and night and in the afternoons when I want to freshen up or remove my makeup. It’s not available in stores but there are many Mary Kay distributors who sell this on Shopee. An oldie but goodie, St. Ives has always been a staple in bath and beauty. I started using this brand when I was a teen in college, though I haven’t been a regular user of their products back then. When I didn't want to spend my school allowance too much on beauty products but still want to splurge on beauty essentials from head to toe, St. Ives was my go-to brand. My favorite is their Blemish Control Apricot Scrub made up of apricot granules, walnut shell powder, and 100% natural ingredients. I use this every other day or on days when I wear heavy makeup. I know some people don’t like this because of the large granules, but I love massaging this onto my face. 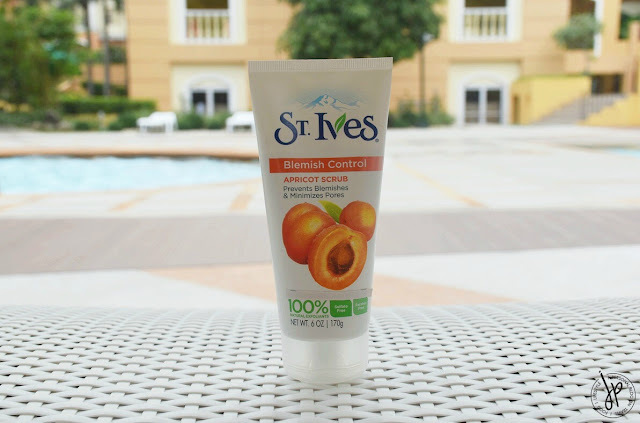 I used Korean branded exfoliating products before (even those products that turn like beads when you massage onto your skin), but nothing beats the cleansing power of St. Ives apricot scrub. Not sure if it really does something to minimize my pores or prevent blemishes, but it helps dry out tiny pimples overnight. A few months ago, a friend told me about a sulfate-free shampoo and conditioner brand that’s made with organic ingredients, and how organic hair products are not just good for the hair but for the skin, too. I was unsure if I’ve used an organic shampoo or conditioner before, but I was surprised when I picked up my second bottle of OGX Repairing Awapuhi Ginger Conditioner. I never paid attention to the brand – only to the variant because I adore the scent. Didn’t expect that the conditioner I’ve been loving is actually an organic product. Aside from its main ingredient Awapuhi Ginger, this conditioner is infused with keratin proteins which lessen frizz and damage, and soften colored-treated hair. It smells soooo good, too! Nothing like the usual ginger I swear! I’m not exaggerating, but this is THE BEST conditioner I tried for color-treated hair. I’m not particular with any shampoo, but if I have to choose a conditioner, this one is my top choice. As soon as I apply this onto the tips of my hair, I feel how it immediately softens and makes it easy for me to hand-comb my hair. When my hair was bleached last year, the tips became brittle and they dried out so bad, that I had to use twice the amount of my regular conditioner. With OGX, I only need half the amount. And since OGX hair products are sulfate-free, this lessens the chances of damaging hair color. At the same time, sulfate-free products can be used by people with sensitive skin. The only downside I find in this conditioner is its very steep price. Colored hair is prone to damage and split ends so salons advice clients to get treatments at least once a month. Since I have long and thick hair, getting treatments on a regular basis is expensive and time consuming. So to give my hair the extra nourishing it needs, what I do is apply Etude House Silk Scarf Hair Essence on the ends of my towel-dried hair for added moisture, shine and softness. I like that it comes in a pump bottle for easy product dispensing. It has a fruity floral scent, but the scent doesn’t last long. I use 2 to 3 pumps of the product, rub my palms together, and gently pat and comb-through the ends of my hair. The softness and smoothness last for about 7 hours before the ends start to become tangled again. Still, this formulation is better than our local hair shine or hair cream products that only make my hair look clumpy and oily. Etude House Philippines carries this hair essence but they run out pretty quickly. While it takes me a while to bathe and get ready, I don’t use body lotion frequently. I just don’t like the sticky feeling of lotion because it’s so hot and humid in the Philippines. Because of that, I need a body wash or a shower gel that’s got immense moisturizing power and doesn’t strip the skin of its natural oils. The best ones I used so far are shower gels from The Body Shop. This brand is known for their delectable bath and fragrance products, and they use blends of natural ingredients and essential oils. What I do is put a small dollop of shower gel onto a mesh bath sponge and that’s enough for my entire body. After rinsing, I can immediately feel how smooth and moisturized my skin is. And when I step out of the shower, the lovely scent still lingers on my skin. That’s why I know when my husband used my shower gel. He loves smelling good, too! My favorite scents (in particular order) are Pink Grapefruit, Olive (my husband's fave), and Satsuma. I stock up on them when they’re on 40-50% discount (which happens very frequently), but I buy Pink Grapefruit full price because it’s a seasonal scent and very hard to find in Manila. A 250ml bottle lasts on me for 1.5 to 2 months. It’s very important for us women to make sure our lady parts are fresh and clean all the time. Using feminine wash keeps away odor and bad bacteria. Some gynaecologists suggest not to use antiseptic feminine wash everyday, but a mild cleanser such as pH Care Intimate Wash is safe for daily use. I like that this brand has several scents that will fit any woman’s preference. I appreciate using this product especially during monthly periods when I need extra cleansing down there. 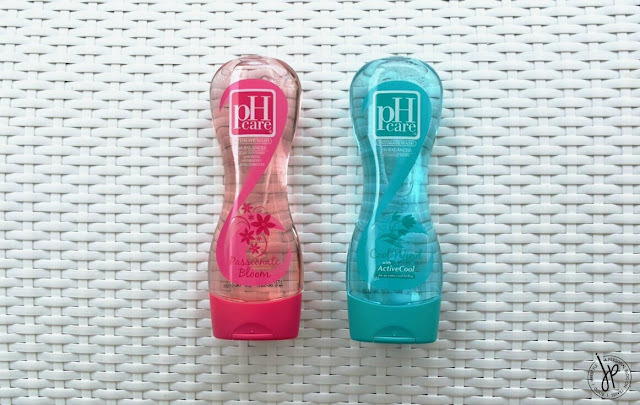 I always keep two bottles of pH Care in my bathroom: Passionate Bloom scent (pink) near the toilet and Cool Wind (green) at the shower area. I always buy the biggest bottle because it’s more cost-effective. However, I take the 50ml bottle with me when I travel and I rotate the scents among Powder Fresh, Guava Leaf Extract, and Papaya Extract. 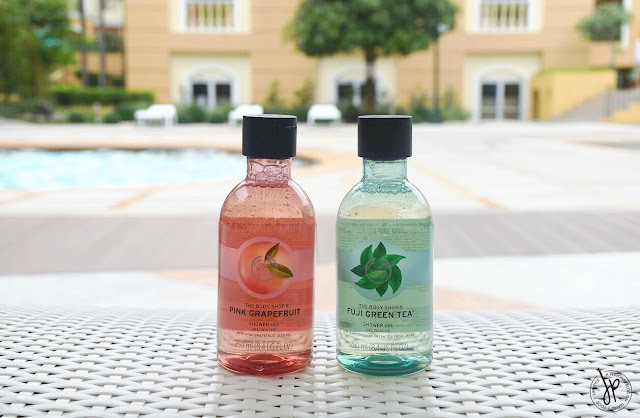 It’s actually very cool that we have affordable and travel size intimate wash here in the Philippines. When I was in Seoul last year, it was very difficult to find a feminine wash in the drugstore and supermarket. And when I found one, it cost almost Php 400 a bottle. When I was a fresh graduate, I used to have many pimples on my face, chest, and back. I always get cystic acne on my face and I don't even wear makeup back then! My dermatologist prescribed using kojic soap for my face and body, as this helps dry out pimples fast and lighten blemishes quickly. Now that I don’t have to deal with stubborn acne anymore, using kojic soap has just become a habit. I use this to lighten my skin (lighten and not whiten), especially on my arms and legs which always get exposed to sunlight. I’ve been using the brand Kojie San for 8-9 years now. At first they only supply kojic acid soap to dermatologists. However, a massive demand for the product came about. So Kojie San made the soap accessible to the public in a much affordable price. 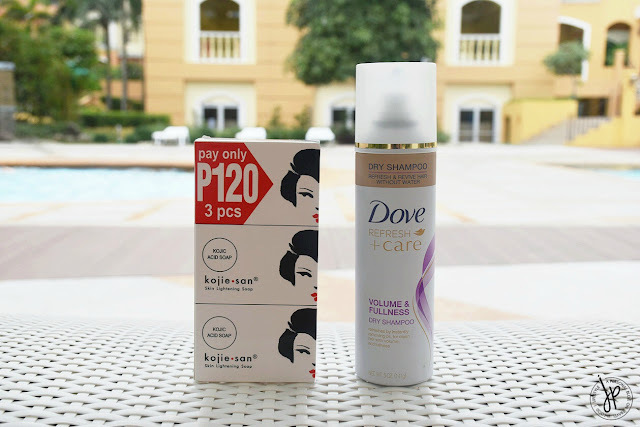 I must admit – beauty companies did it right when they created dry shampoo! On an average, I spend 30 minutes in the bathroom when I bathe. And more than half the time, I shampoo and condition my hair. But on days when I’m in a hurry to wash my hair because of quick errands or when my scalp becomes oily, I spray Dove Refresh + Care Volume & Fullness Dry Shampoo on my roots and lightly run my fingers on areas where I sprayed dry shampoo. This only takes a couple of minutes, and I get instant volume, revitalized scent, and clean hair without the use of water. I like that the effect is more than just a shampoo, but it’s also a subtle styling product. 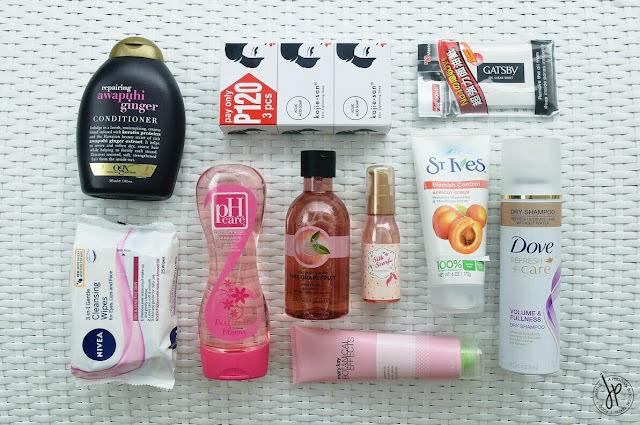 Out of all the brands I tried, Dove is one of the best and one of the most affordable. My only gripe is that Dove doesn’t have it in trial size. How does your daily hygiene look like? What products do you use regularly? Let me know what your top picks are in the comment section! Disclaimer: This is not a sponsored post. I bought these beauty items with my own money and my thoughts on these products are 100% honest and based on my experience.